Please acknowledge the pattern of center may be different slightly from the picture. 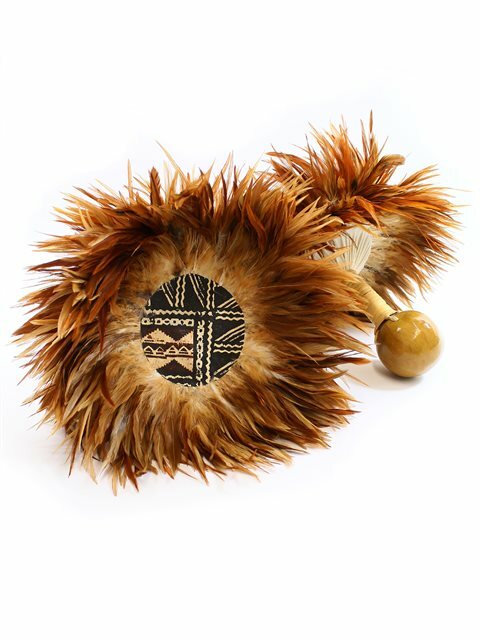 The `uli`uli are percussion instruments used by both male and female dancers, usually in high-paced rhythmic performances. Our `uli`uli have yellow feathered centers with surrounding red feathers. Our `uli`uli are handmade from professional hula supplies of the highest quality by an expert craftsman with over 30 years of experience. This product from this particular craftsman is popular among local hula dancers. Please come give them a shake if you are in town! Please be aware that this product is made from natural products thus shapes and sizes are not 100% identical. In the case of damage or breakage within 30 days of the date of purchase, we will repair or exchange damaged instruments for free. After 30 days maintenance repairs, depending on amount of damage, can be made at an additional charge. **Depending on the state of damage, items repairs may not be possible. For any repairs please first contact us via email with the cause of the damage and a photo of the damaged product. ** Any damage as a result of negligence, misuse, or abuse above normal use, will be repaired free of charge under this warranty however return shipping costs will be the responsibility of the customer. Diamond Cabebe Shell Necklace 3 x 2.25"
Wonderful!!! Exactly as described, sounds beautiful. I appreciate the smaller sizes, since these are for my daughter. I got to try these out at a free hula class during a visit to Hawaii. I’m so excited to get to use them at home.